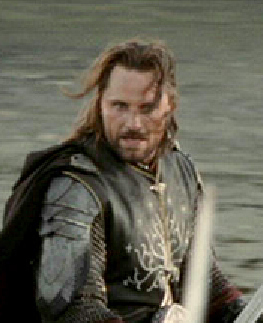 let’s start our journey of connection at the film Lord Of The Rings: The Return of the King – and lets take ourselves to the final reckoning at the Black Gate – and Aragorn’s rousing speech in the final battle scene. A sword-day, a red day, ere the sun rises! But Aragorn’s speech goes to a different level. And it is due to something beyond mere content. Something rings (sorry) more deeply here: something is different: his voice: the gruffness of before – the hoarse whisper of Strider, the ranger’s voice, has taken on a more measured passion – a more kingly tenor. But this kingly voice sounds faintly familiar. Whose voice echoes down through the celluloid corridors to sound out through the lips of Viggo Mortgensen? Richard Burton: Hamlet. 1964. Produced and directed for the stage and screen by the immutable Sir John Gielgud. Viggo’s voice, whether by prescription or accident sounds out the spirit of Burton’s Hamlet through the mouth of a different King. Strangely, another more abstracted, wholly subjective and subtle connection exists for me – through Gandalf or should I say Sir Ian McKellen: whom has always reminded me of Gielgud. On the matter of Richard Burton, when asked recently whom I thought, beyond Bond et al,was the yet to be discovered Look in gentlemen’s sartoria – for me, it is Richard Burton. Apart from the fact that, he already achieves 11 out of 10 on a blokey rating just for marrying one of if not the most beautiful women of the age (shallow is the new deep), Burton also found himself a famous sporter of fashion signature pieces like the toweling polo shirt – three button, splayed collar, sun burnt colours – which he sported in American Bars from Portofino to St Tropez to Mustique. But look further and his look expands into multiple sartorial shards from the broken glass of 50’s 60’s and 70’s fashion. The ‘almost Elvis’ suit and collar combos off set by slicked back hair and powder-white sideburns firing across rippled sun drenched skin. The smokey southern deconstructed suits of a very twisted George in Who’s Afraid of Virginia Woolf. To the beat generation black of Hamlet and the stripped back Medusa Touch. So Burton is The Man for me when it comes to the next British Look. It’s amazing how a still from a movie can invoke a memory that rockets you back to a moment in time with such a breathtaking ferocity and such clarity. While looking at stills of Richard Burton in the film The Medusa Touch, I was reminded of the depth and what I can only refer to a the particular ‘blue’-ness of his eyes – not bright crystal like O’Toole’s – more a deep mined blue with graphite shades and green eddies. Regardless, the song that rushed to the back of my mind while looking at the stills was Crystal Gale’s Don’t it make your Brown Eyes blue. Now disregarding the fact that I had a massive crush on her for a while (though nothing will EVER outshine the tenure of my teenage crush on Debbie Harry – currently still burning brightly), and playful word recognition and threads aside (Blue Eyes – Brown Eyes) it was the ‘time’ that played up into my head – that moment of being in the world through which that song floated. The clothes I wore. The music I loved. The posters on my cork tiled patch of wall. All those discomforts of self: the intensity of passions and uncertainties. The smell of cut grass on school playing fields. The face of a girl that I liked but couldn’t even fathom how to look at let alone try and speak to. Dislocated parents. Dislocated body (nothing my body did bore any relation to what went on in my head – it was a law unto itself). A time made as viscerally present as it is past. All through a song and a film still. Speaking of posters from the 1970s – one of the posters that hung for years on my wall was a Lord Of The Rings poster Illustrated by J Caulty. The poster’s central characters are, I believe, Gandalf and Frodo Baggins. Around its periphery we see Aragorn, Gimley, Legolas and Gollum amongst others, interlaced with twisting pathways, and realms like the distant Lothlorien, and the Shire – all topped with a curling embellishment on which hung a golden crown. Around the poster ran a border embellished with men, elves, dwarves, riders and assorted others. But dead centre at the bottom of this border lay the magic: a small iris that looked into a mysterious land: as if we are peering out from the dark innards of the great Mirkwood to the lush lands beyond. And I remember thinking that the character I thought to be Aragorn (but it is actually probably a darker character from the stories) midway up the right hand side of the poster looks like a mash up of Alice Cooper, Mick Ronson, Manhatten Transfer and a Cramps flyer – which just about summed up my musical confusion through the mid to late 70s – a troubled collision of heavy rock & pomp metal, disco, punk, greaser rock and psychobilly. Confused perhaps. But Lord Of The Rings nonetheless. Which brings me back to the return of the king: a virtuous circle of being. So heres to a goes around comes around world where everything is connected – past present and future through sight smell taste touch and sound wound into a cat’s cradle string that we merely reform and reshape depending on the memory doorways we enter through, and to whichever passing thought kicks the embers from the back of our mind into sparks at the front.